UC San Francisco’s School of Medicine ranked fourth nationwide in both research and primary care education this year, according to a new survey conducted by U.S. News & World Report. Results are published in the magazine’s 2015 issue of “Best Graduate Schools,” which appears online today and will be available in stores on April 8. 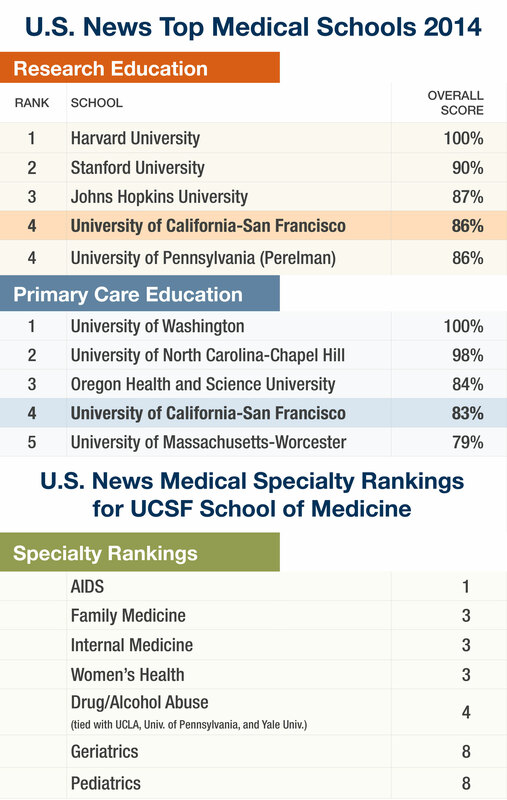 UCSF has the only school of medicine in the nation that ranks in the top five in both research and primary care education, including a tie for fourth place in research education, alongside University of Pennsylvania. The school also ranked in the top 10 in every medical specialty in which it was assessed. Among those, UCSF ranked first for its medical program in HIV/AIDS; third in family medicine, internal medicine and women’s health; and tied for fourth in drug/alcohol abuse education. The new report also includes the 2012 rankings for graduate schools of pharmacy, in which UCSF ranked first for its Doctor of Pharmacy program (PharmD), and the 2011 rankings for nursing. In the latter, the UCSF School of Nursing ranked fourth for both its master’s of nursing program and its nursing-midwifery program. The report also includes last year’s rankings for PhD programs in the biological sciences, in which UCSF placed seventh overall, as well as second and fifth, respectively, in Immunology/Infectious Disease and Biochemistry specialties. U.S. News does not rank graduate schools of dentistry. According to the magazine, the overall medical school rankings are based on two types of data: surveys sent last fall to medical school deans and administrators, and statistical indicators provided by 128 medical schools fully accredited by the Liaison Committee on Medical Education, as well as by the 25 schools of osteopathic medicine fully accredited by the American Osteopathic Association. These data measured such factors as acceptance rates, median Medical College Admission Test score of the entering class, faculty resources and the number of graduates entering primary care. Research activity also was measured by funding from the National Institutes of Health, of which UCSF is the largest public recipient in the nation. Specialty rankings for medical schools were based on surveys of medical school deans and senior faculty. Rankings for Pharmacy were based on surveys sent to deans, administrators and faculty at programs in those fields. • 1st in Pharmacy – In 2012, the latest rankings available, UCSF topped the nation’s schools for its Doctor of Pharmacy program (PharmD). • 4th in Nursing – In 2011, the latest rankings available, UCSF’s School of Nursing ranked fourth nationwide for both its master’s of nursing program and its nursing-midwifery program.